This lovely variety of Clematis has large single flowers which can measure up to 10cm across. The colour is pale pinky- white with rose-lavender edged margins and centres. The flowers have a satin sheen to them and the under-side is a deep rose-lavender with red veins and are produced from early summer to autumn. The leaves are dark green and glossy and despite this being a non-evergreen climber, may remain on the plant during milder winters. 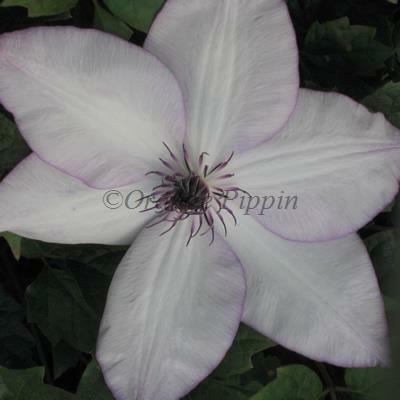 Clematis 'Fond Memories' would make a wonderful gift for someone special. Clematis 'Fond Memories' was raised by Geoffrey Tolver of England and introduced by Thorncroft Clematis Nursery, UK, at the 2004 Chelsea Flower Show. This Clematis should be trained up a trellis, garden fence or wall or supported in a container with bamboo canes or an obelisk and put as a focal point on the patio.